We love Lemonade, but it is hard to find good lemonade. All you see these days is pre-mixed lemonade loaded with sugar. 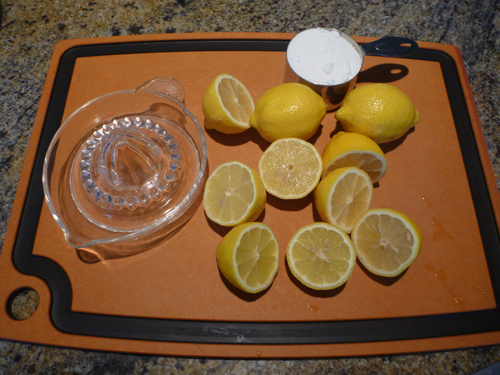 We wanted to make a quick and easy homemade version using yes Real Lemons! So we stumbled upon a recipe claiming to be the best lemonade ever. With all of that boasting we had to put it to the test, so without further adieu, the best lemonade ever (we will see). Place 1 cup water and 1 cup sugar in a small saucepan. Bring to a boil to dissolve sugar. Stir until it is dissolved, and remove from heat. Let cool. This is not the best lemonade we have ever had. It is however a very good recipe. The lemonade is not overly sweet, but it is a bit too sugary for our taste. Kids will almost certainly love this recipe. We liked it better after watering it down a bit. It was extremely fresh with great lemon flavor. The addition of the vanilla was quite unique and refreshing, it helps set this recipe apart from some others you may have seen. If you enjoy lemonade, this is a quality recipe but do not expect to be making "the best ever".